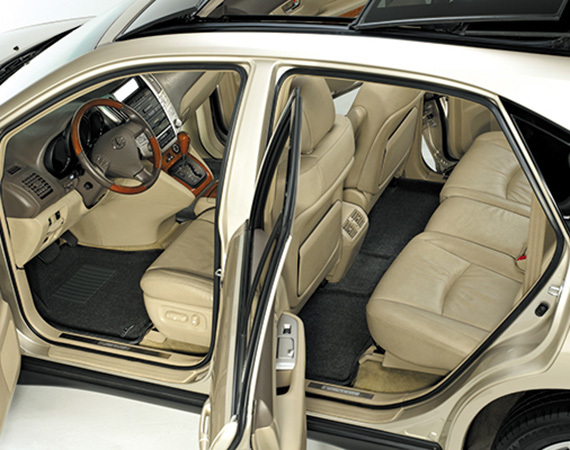 Floor liners offer essential protection to your vehicle. They ensure your interior stays valuable and intact. Whether you think of yourself as a clumsy person or not, there’s always the risk of spilling something and it ending up all over your factory carpet. When you invest in floor mats, they take the hit so your upholstery doesn’t have to. In this article, you can learn more about the fitments that different floor mats offer. And, once you’ve chosen the type of fit that best suits your needs you can go on to choose your material and pattern or print – rubber, vinyl, soft plush – There are plenty of options, but let’s not get ahead of ourselves. Universal floor mats are usually the most financially-friendly option when it comes to protecting your vehicle’s interior. Although they might not offer an exact fit, some well-known brands and vehicles come close. 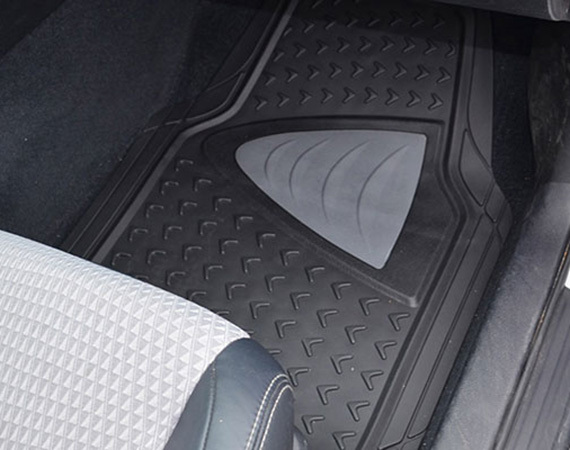 Many universal floor liners like WeatherTech AVM Floor Mats provide lines or patterns that are easy to cut through in case you need to adjust them to fit your carpet area a little better. Fitment and quality don’t necessarily come hand in hand though, universal floor mats provide rugged protection and keep spills away from your interior just as well as other floor mat types. Semi-custom floor mats have come a long way, similar to custom mats, some offer a digital-cut look to match your vehicle’s carpet closely. Most, like Husky Liners Heavy-Duty Floor Mats offer trimming guides, for any cutting that might be necessary to fit your vehicle, and are durably made to protect your carpet from rain and mud. Unlike some universal floor mats, semi-custom liners require you to input your vehicle year, make and model to ensure you get a product that closely resembles the lines of your specific carpet footing. Finally, custom floor mats are the ones that offer the best look and fitment. Although the prices on some might make you shy away, our 1-Year, Lower Price Guarantee ensures you get the best deal if this is the type of interior protection you’re after. With custom mats, your specific model is taken into consideration to digitally mold the mats and help them contour to your vehicle’s every line and curve, and in some cases like with Maxliner MaxFloormats Floor Liners, including the doorjamb. Now that you’re familiar with the different types of floor mats, let’s do a little recap. 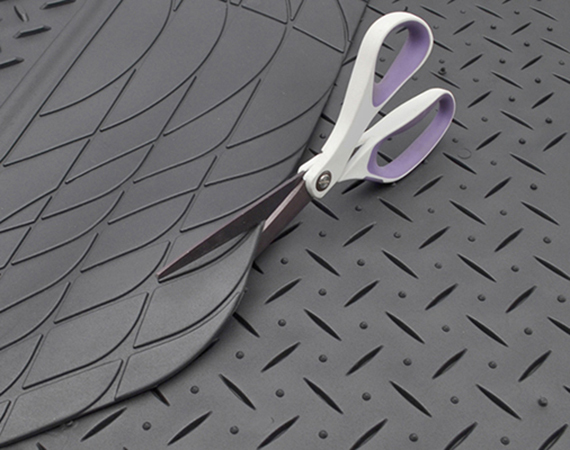 Universal and semi-custom floor mats might be easier on your wallet, but will likely require trimming and cutting. Custom mats on the other hand are the most aesthetically pleasing option, but it’s important to keep in mind that like all custom orders, processing times are longer. Like ordering a la carte, something that’s made specifically for you will take longer to ship and deliver. And, if upon receiving them, you change your mind, you might incur a restocking or return fee, since the product was created just for you. Although all three are created to protect your carpet from dirt, spills, mud and rain, choosing between these three types of fitment is completely up to your personal preference. If you’re still struggling to decide and would like more help with that decision, you can reach out to any of our trained customer support team members for answers. Simply click on the live chat button or call 1-800-874-8888.